Since we had such a hard, cold winter, a lot of the wildflowers I expected to see were not y et in bloom. 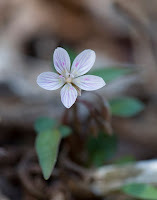 But a few of the really early bloomers were, some of the flowers we saw included: the tiny Harbinger of Spring (right), Sharp-lobed Hepatica (left), Toothwort, Carolina Spring Beauty (center), Bloodroot (left), and Spicebush. 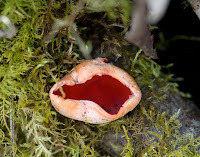 But the most amazing thing I saw today was the beautiful Scarlet Cup fungus. I got quite a surprise when I tried to gently blow a piece of dead leaf out of the cup before I photographed it. Seconds after I puffed into the fungus, it puffed back!!! Actually, it suddenly gave off a little cloud of spores! I had not touched it with my hands or a stick, just my breath. I'm assuming that it may give off its spores when the wind blows on it. Later when Mika saw this happen, she squealed with delight! I'm sure the fishermen got quite a kick out of that! Even tree leaf buds can be interesting to observe. I noticed this pretty pink Buckeye bud just getting ready to open. Anyone who has followed this blog in the past knows how much I like spiders! 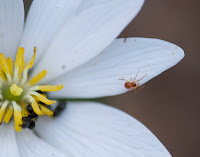 So, I was happy when I saw a tiny spider on a Bloodroot flower today! It was a little male (you can tell by his round pedipalps). I won't go into what they are for since this is a family-friendly blog! ;) The little black objects are beetles. 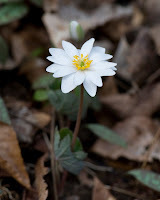 We saw them on Hepatica flowers too. I can't wait to go out on the trail again! Keep checking back for wildflower bloom updates! It turned out to be a fantabulous day thanks to you! That fungus was so interesting! Did you get a picture with smoke?